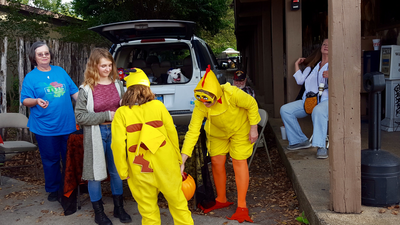 October 31, 2016 - There were 5 Auxiliary Members and 1 Post Member in attendance this year to pass out Candy to the young folks and the young at heart of our community. Mary Jane, Chasadiy and Chick passing out candy and Linae looking on. Neta, Linae and Jaci checking out the different nut costumes, each one was a different nut and then one burlap bag was the bag of nuts. Chicka, Chasadiy and Mary Jane passing out candy. February 15, 2014 - After a recent visit to Cypress Creek Cafe and the Buzzard Bar with family, it was discovered that all the branch of the service flags were represented in the Court yard but one. 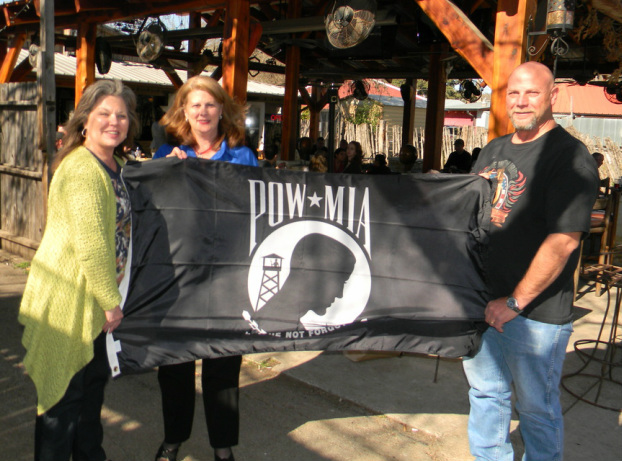 President Odell presented a POW/MIA flag as well as an American Flag to Trish and Randy Uselton owners of Cypress Creek Cafe and The Buzzard Bar. A big Thank You to Trish and Randy for flying these flags, that mean so much to our Military families. February 15, 2014 - 11 Units of blood were collected today for the Blood Center of Central Texas. 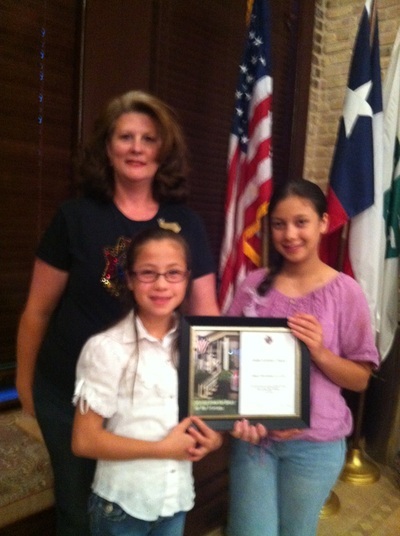 Fancy Feathers 4-H had cookbooks available for sale as well as door prizes for the donors. 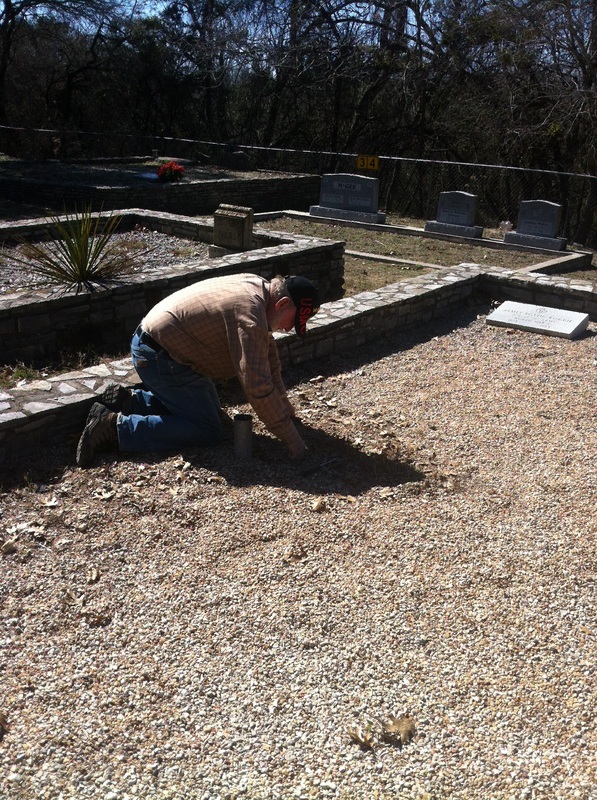 President Odell pretended to do C.P.R. on Frank Ross telling him we will get your blood one way or the other. The joke was on her, she got 2 bandaids. 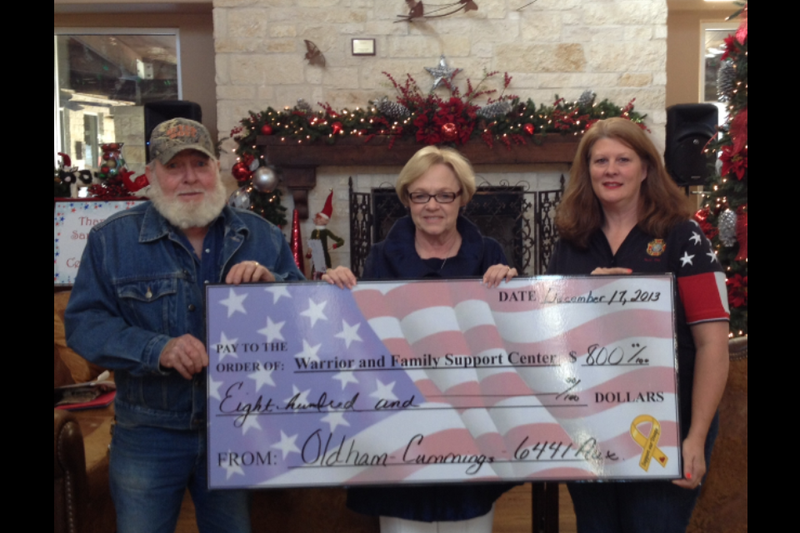 December 17, 2013 - Ladies Auxiliary President Neta Odell with the support of Post Member Frank Ross of Post 6441 made a donation of $800.00 on behalf of the Ladies Auxiliary to the Warrior and Family Support Center at Fort Sam Houston in San Antonio, Texas. This money was raised by raffling items at the 2nd Annual Cowboy/Veteran Golf Tournament. 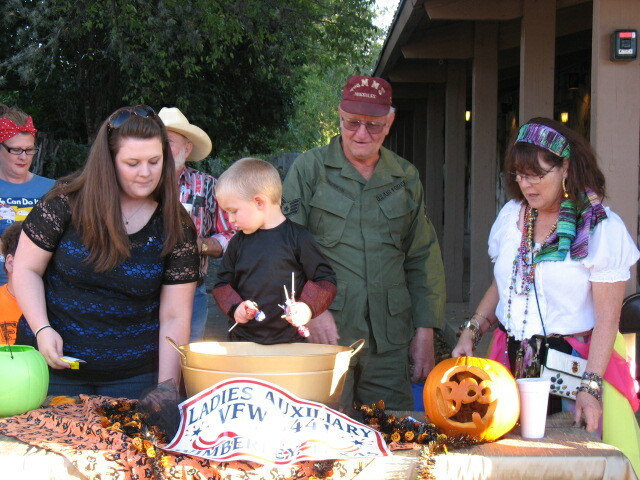 The Ladies donated all money's made plus the cost of the items that were raffled. 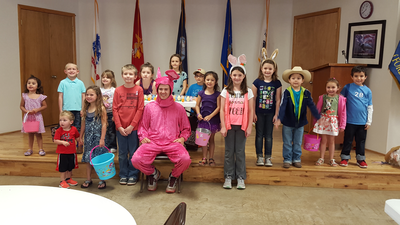 April 2013 - Oldham-Cummings Post 6441 Ladies Auxiliary hosted the August Birthday Party for Deer Creek Nursing and Rehabilitation Center. Entertainment was provided by Tori Robinson daughter of Auxiliary Member Michelle Robinson. 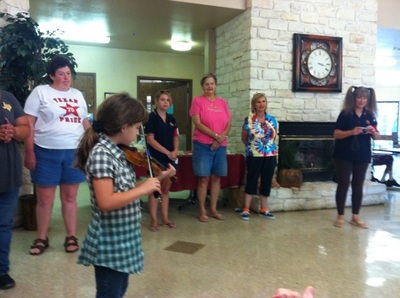 The residents of Deer Creek loved that she was so young and how well she played the violin. 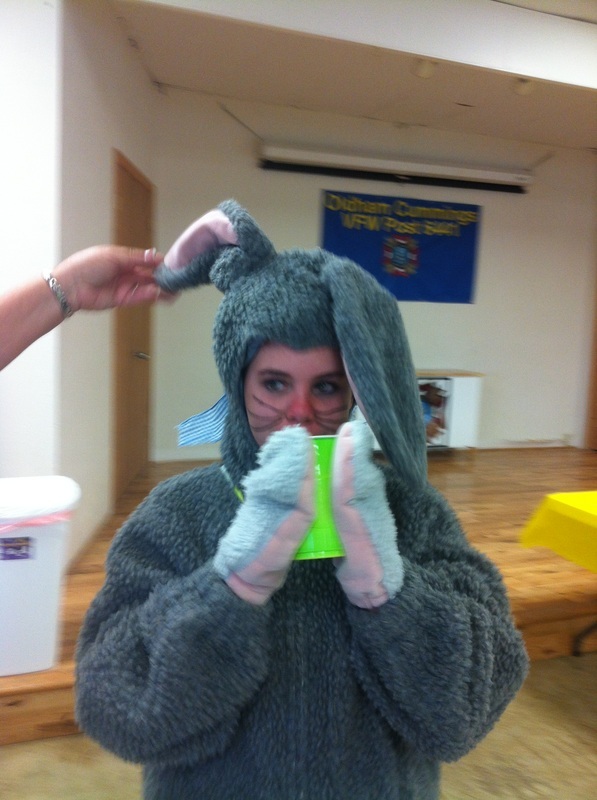 Mrs. Adams said I was a cousin...She was right. 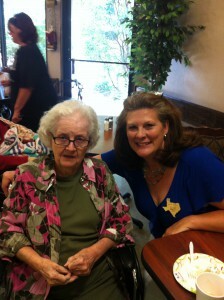 Diane Jordan serving cake and cookies. 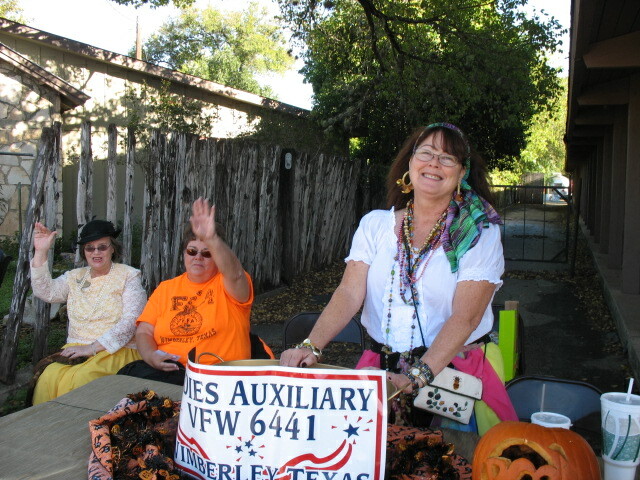 VFW Post 6441 Ladies Auxiliary welcomes your food donations for the Crisis Bread Basket. Bring non-perishable food to Bingo and leave it on the coffee table next to the front door and it will be taken to Crisis Bread Basket . Donations are greatly appreciated. 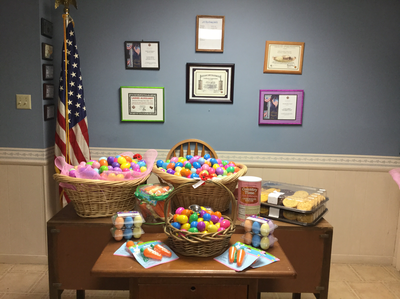 In addition to your donations the Ladies Auxiliary donates non-perishable food as well. 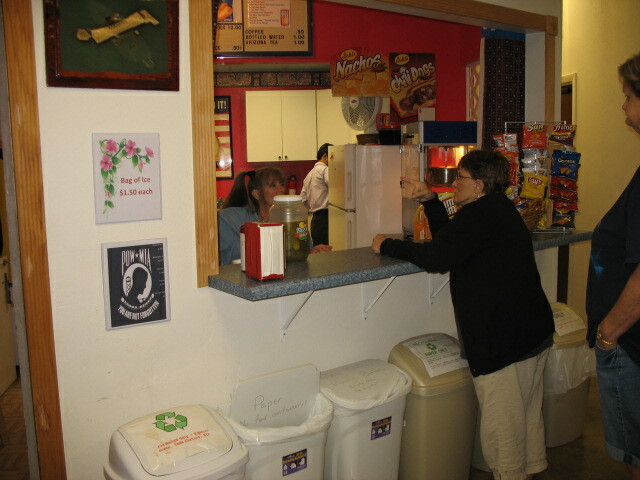 Box tops for Education are collected at the VFW hall. You may place them in the box in the window, and they will be donated to Jacobs Well School. 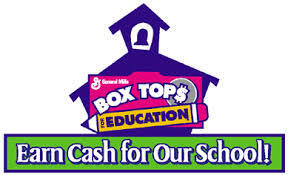 There have been 234 box tops donated to date. Thank you for your contributions. To date there have been 234 box tops turned in to Jacobs Well Elementary. Campbell's Soup labels are collected and sent to the V.F.W. 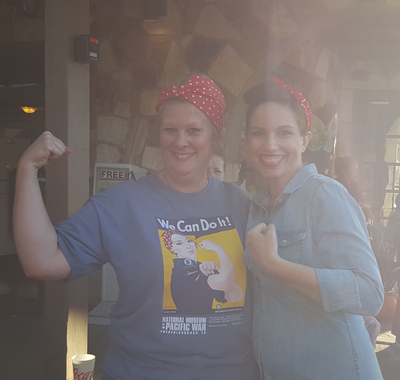 National Home for Children, in Eaton Rapids, MI. 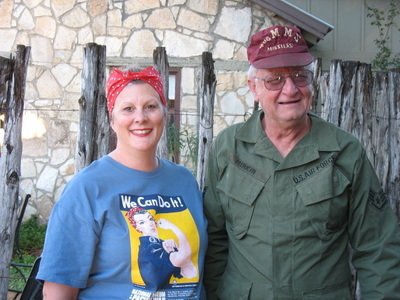 The National Home for Children is solely supported by the V.F.W. and it's Ladies Auxiliary's. 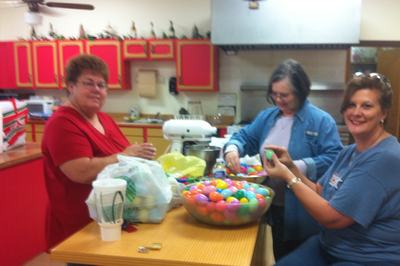 To date Oldham-Cummings Post 6441's Ladies Auxiliary has sent in 60 Labels for Education. 3/17/2014 Mailed in another 20 Labels for Education today, this makes the total to date 80 Labels. March 26. 2016 - 4th Annual Easter Egg Hunt - There were 5 Auxilary members present as well as 20 children hunting eggs. Not all were up to being in the photo with the bunny. 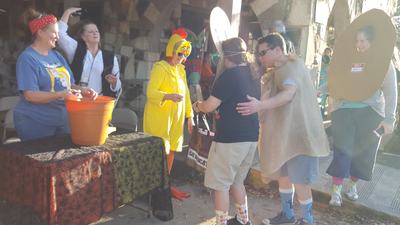 Prizes were given for the golden eggs and refreshments of cookies and lemonade were served. 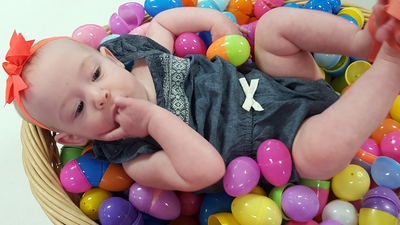 This year our two youngest Auxiliary members came up with some games for the kids to play. Youngest Egg Hunter....found a basket full! 15 Kiddos willing to take a picture with the Bunny! 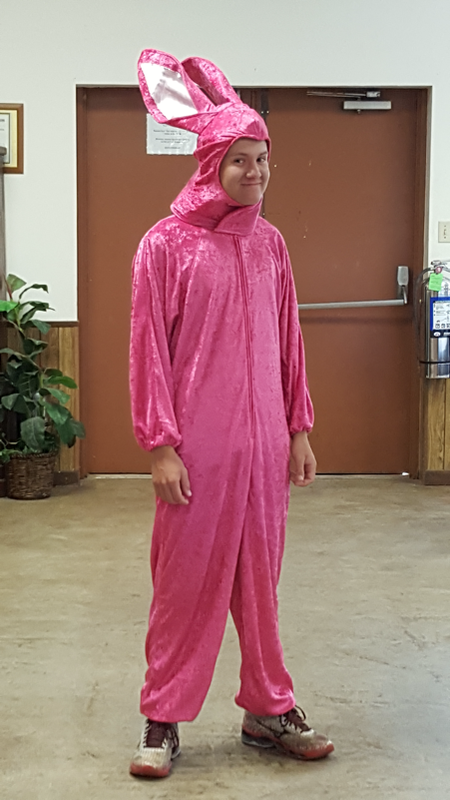 Volunteer Bunny.....Yes, he knew the bunny suit was PINK! 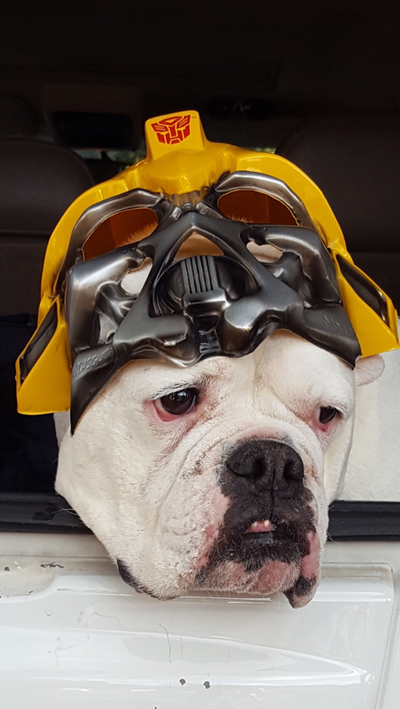 2015 - Oops forgot to post pictures....In the process of looking for photos to post. 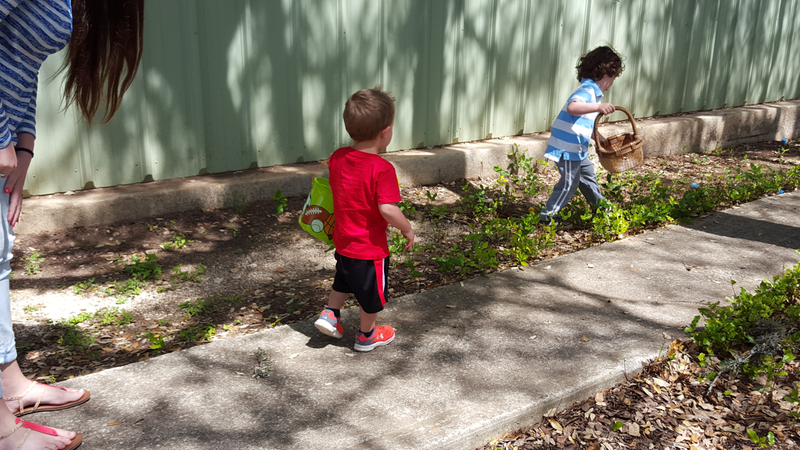 2nd Annual Post Easter Egg Hunt was April 19th 2014 at 12:30pm at the Post Home. All kids, grandchildren, nieces and nephews of Post members are welcome. Paula, Mary Jane and Neta preparing Easter Eggs. 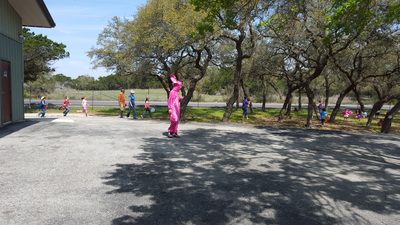 1st Annual -2013 - There were 15 kids that hunted Easter Eggs at the first Post Easter Egg Hunt, with prizes for all. 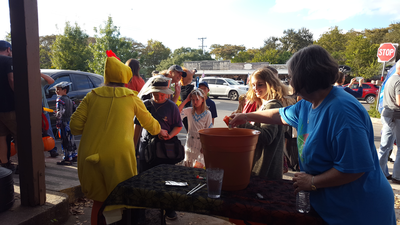 This year the Ladies of the Auxiliary passed out candy on the square to the trick or treater's. 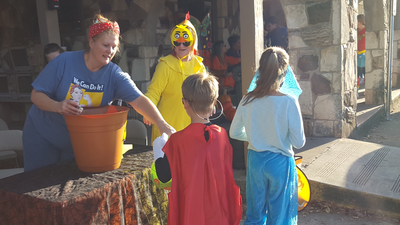 Included with the kids candy were slips of paper to help increase awareness about bullying. 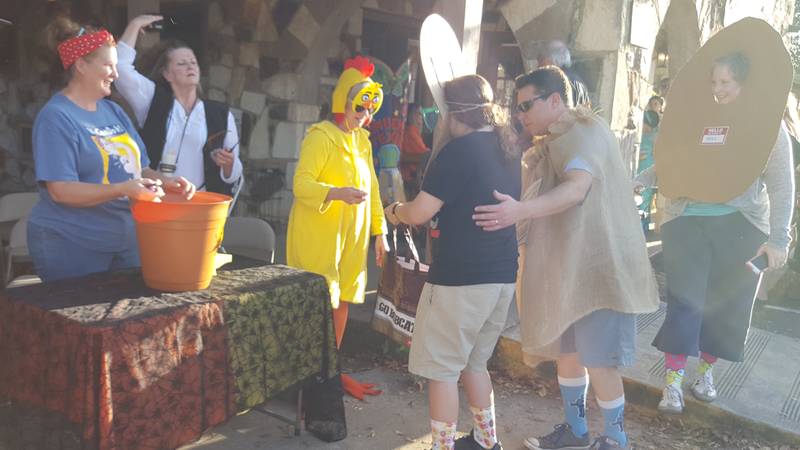 There were seven Auxiliary Sisters and two Post Members there to pass out candy.We even had a couple of guys come by dressed up as Constables; don't you know you can be arrested for impersonating an officer of the law. 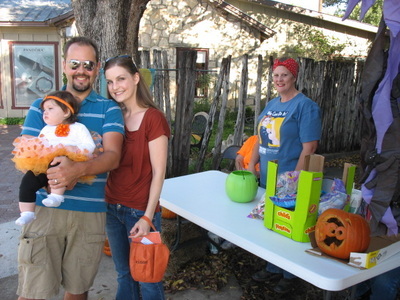 (lol) We had some tiny babies dressed to the nines, all the way up to the Sweet little lady in the wheel chair that was chased down and given candy. 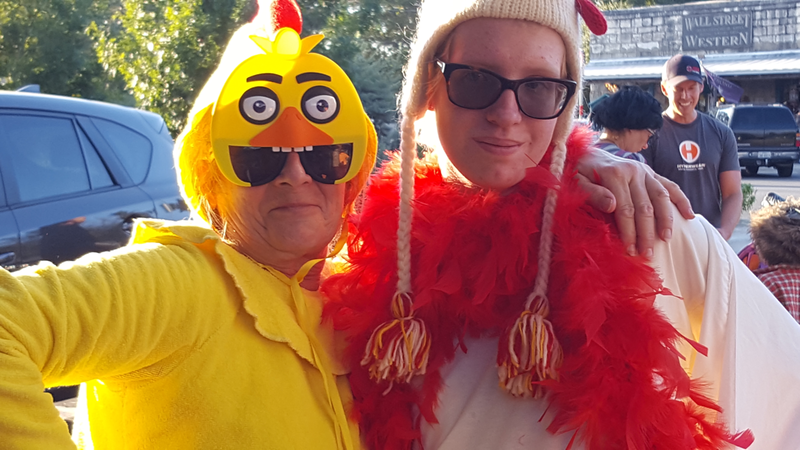 There were some pretty cute costumes on the square this year. 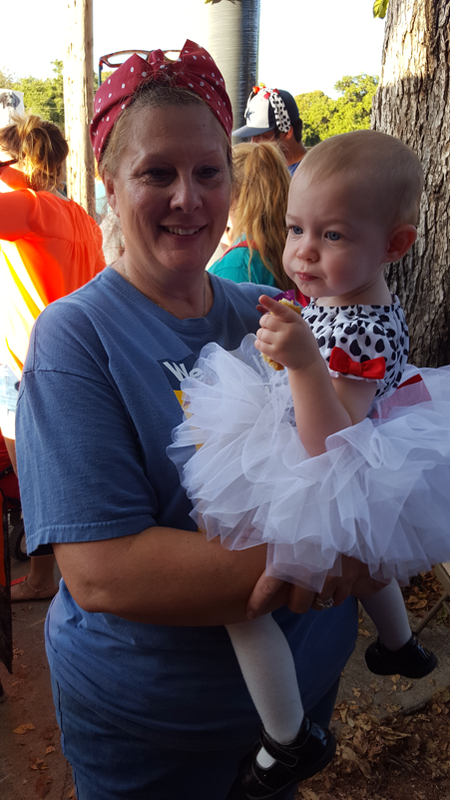 "Early Birds" isn't she adorable! 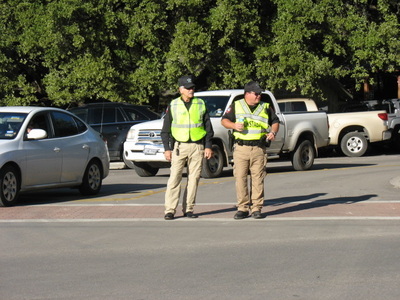 Impersonating officers, You can go to jail for that! 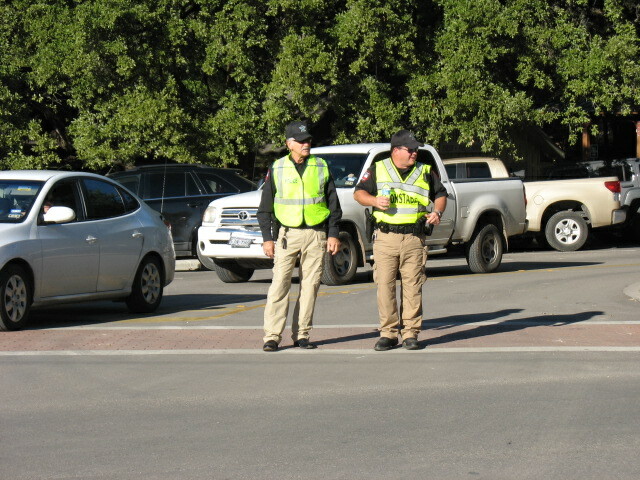 Auxiliary and Post Members working together. 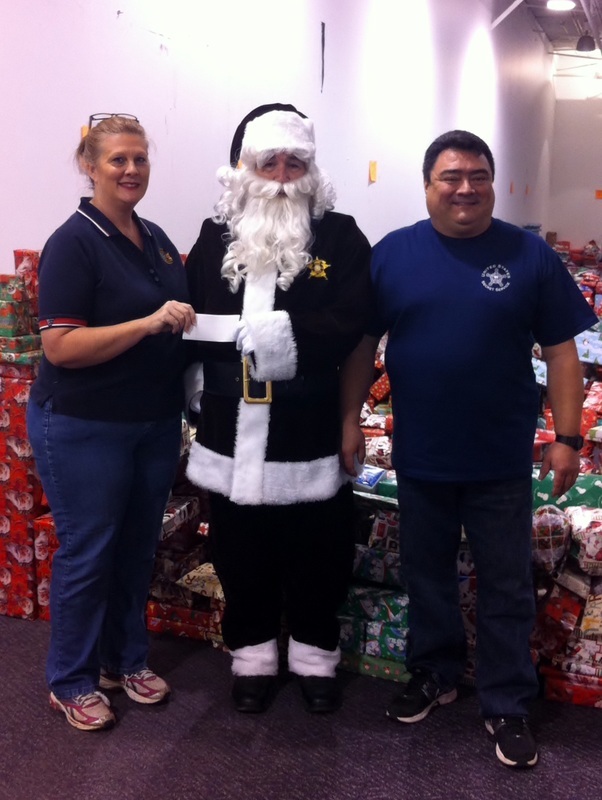 VFW Post 6441 Ladies Auxiliary President Neta Odell presents a check to Brown Santa and Ray Gutierrez of the Hays County Sheriff’s Department to aid in their efforts to supply gifts to children in need in Hays County. Gifts from the Ladies Auxiliary were delivered to Brown Santa earlier in the week. 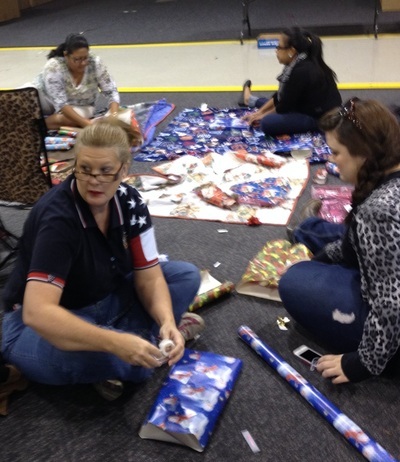 President Odell said “my family will make wrapping gifts for Brown Santa an annual event”. President Odell was joined in wrapping gifts by VFW Post 6441 member Frank Ross as well as Auxiliary member Julie Edwards and her Grandson Hagen Edwards as well as other extended family. The Auxiliary had planned of mailing a check, but when President Odell’s daughter Julie came up with the idea to help wrap gifts as a family the plans changed a bit, and with Santa there...who could resist a photo with Santa. Wrapping gifts for Brown Santa! The Ladies of Post 6441 have formed the Blanket Brigade! 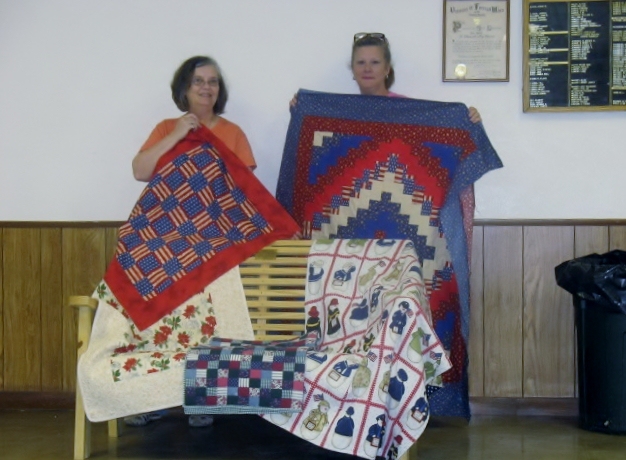 The Ladies make quilts to send to our Military Personnel who have been wounded. 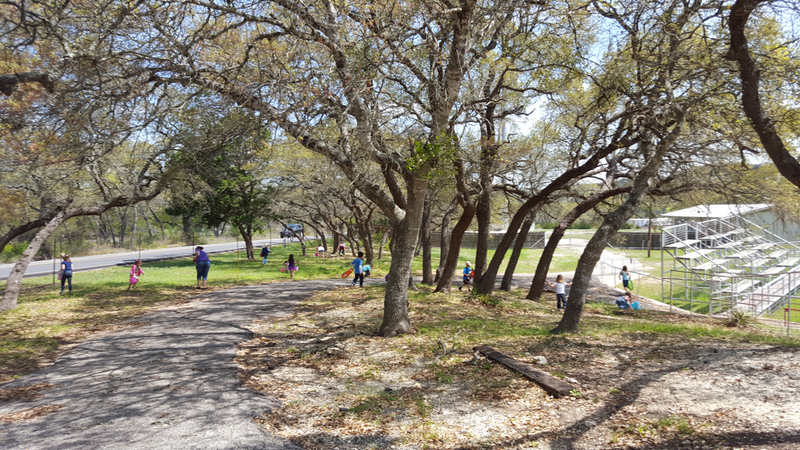 If you would like to help or just join in the fun please come join us. The Blanket Brigade will start by making quilts with materials on hand. So if you have an extra stash that you just never seem to get around to using, we would be happy to incorporate it into our quilts. 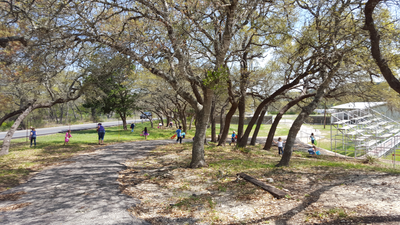 Or if you would like to donate your time you are more than welcome to come join us! 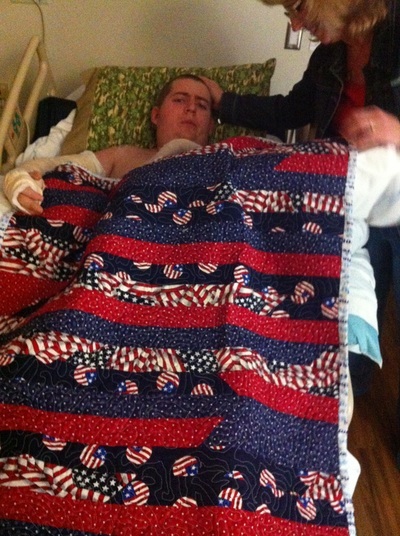 If you have a quilt top you would like to donate, we have the means to finish it and get it to a wounded service member. Please check our Calendar for Date and Time the Blanket Brigade will meet. 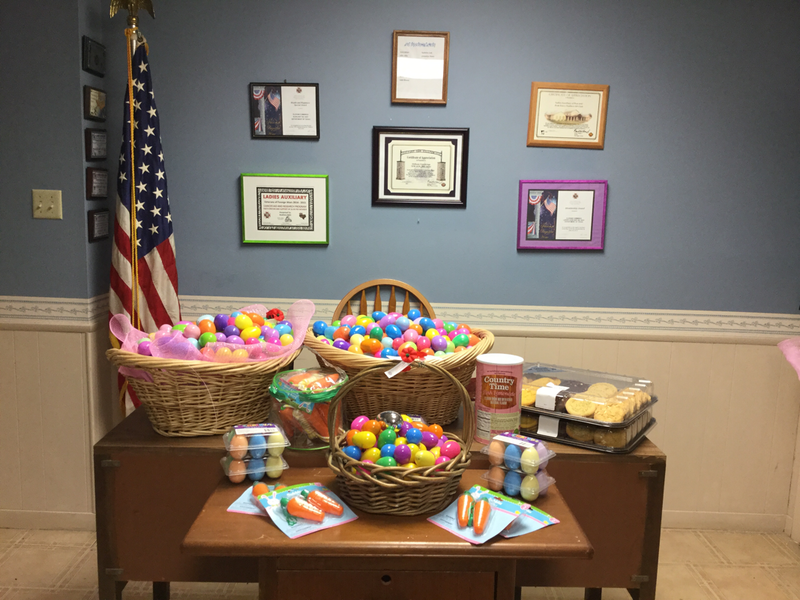 Meetings will be in the VFW Auxiliary Meeting Room at Post 6441 unless there are too many of us then we will meet in the main Post hall. 1st Quilt to Specialist Jeremy Young, during his stay in the Poly-trauma Unit at Audie Murphy Hospital, San Antonio, TX. 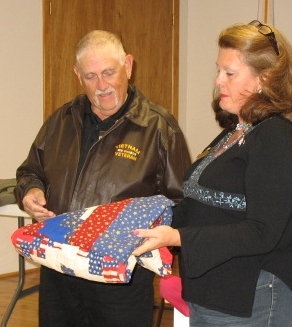 Quilt presentation to Commander Gibbs. 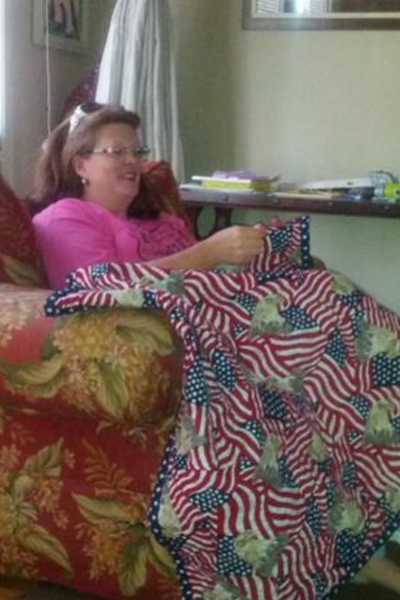 Working on Quilts for Americas Heroes! 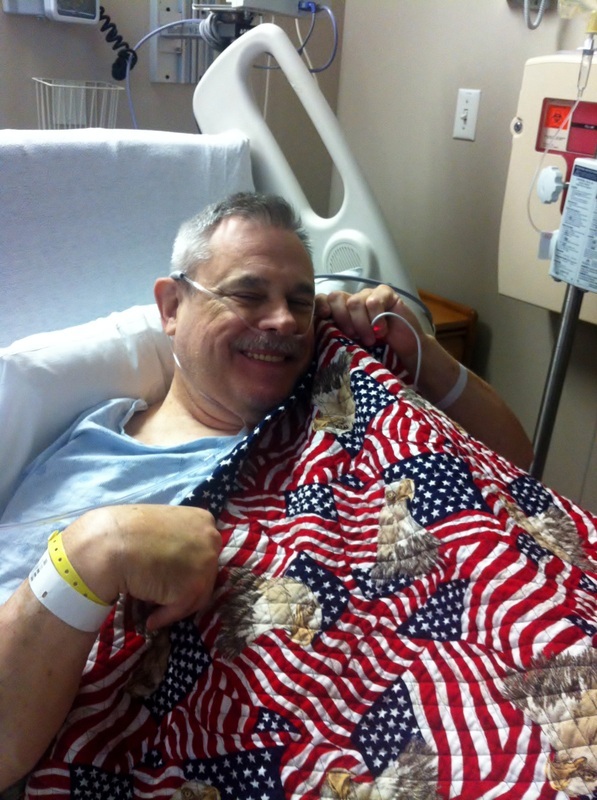 Commander Dave Adams with his new quilt. At the Hays County 4-H 2012-2013 Awards night held August 5, 2013, in the Old Kyle City Hall. 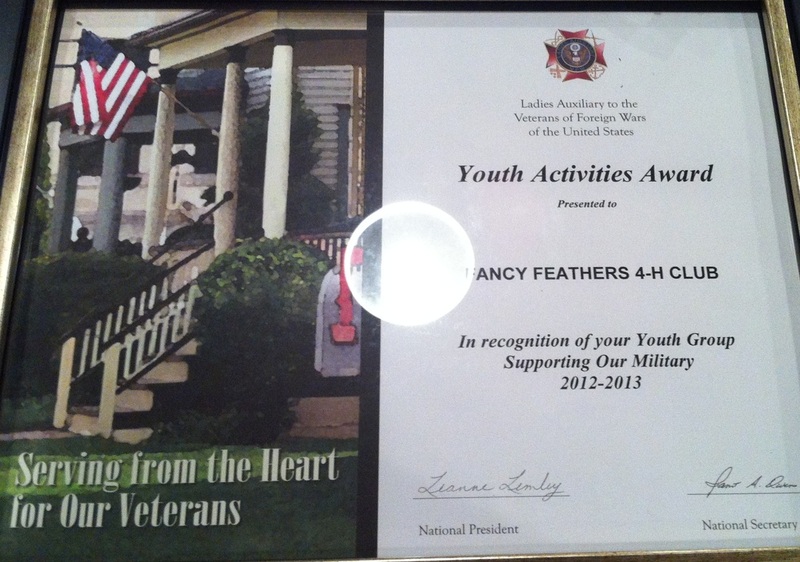 VFW Post 6411 Ladies Auxiliary President Neta Odell presented Fancy Feather 4-H the Youth Activities Award. This award is given to youth who support our military service men and women and their families. 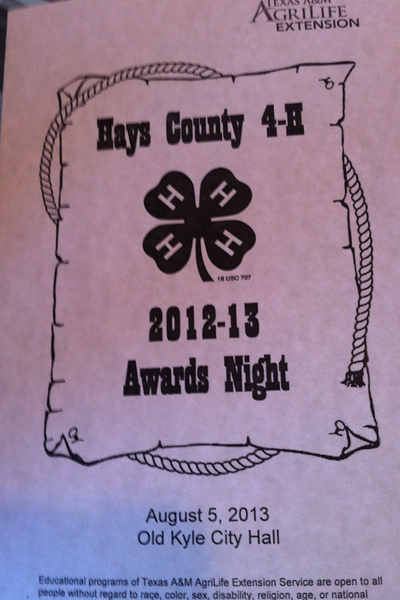 Congratulations Fancy Feathers 4-H on a job well done. 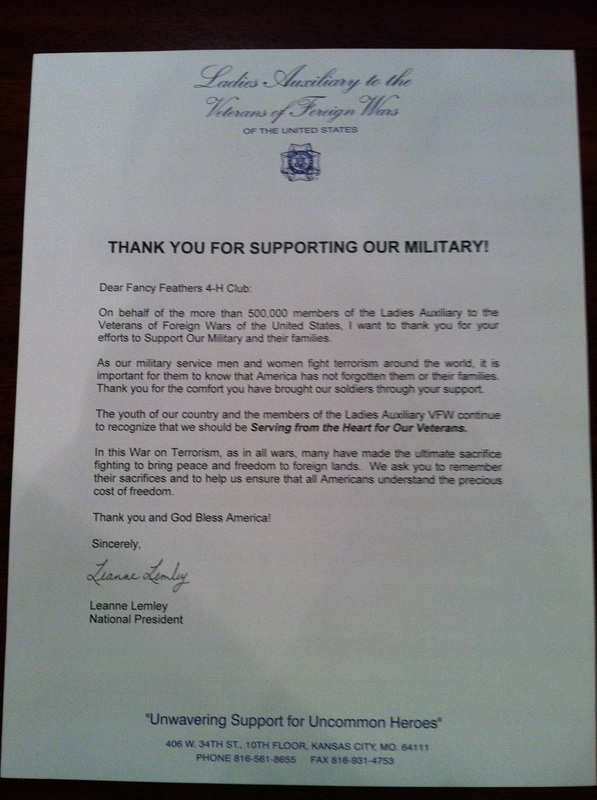 Also included with the Award was a letter From National President Leanne Lemley. 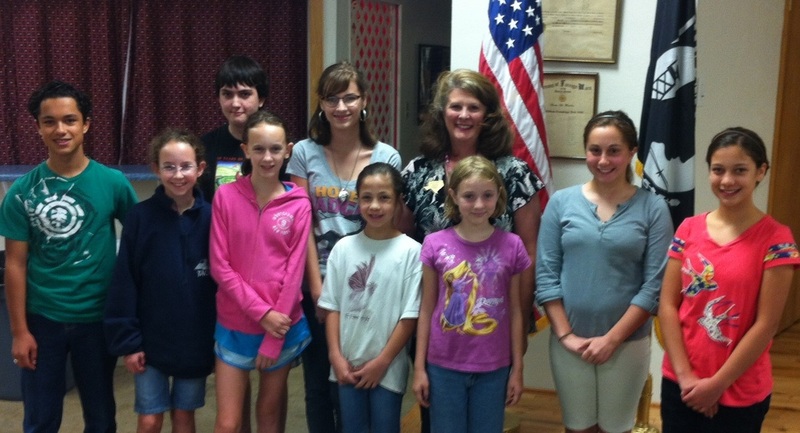 Ladies Auxiliary President, Neta Odell installed the officers of Fancy Feathers 4-H for the 2013-2014 year. Congratulations to the new officers! 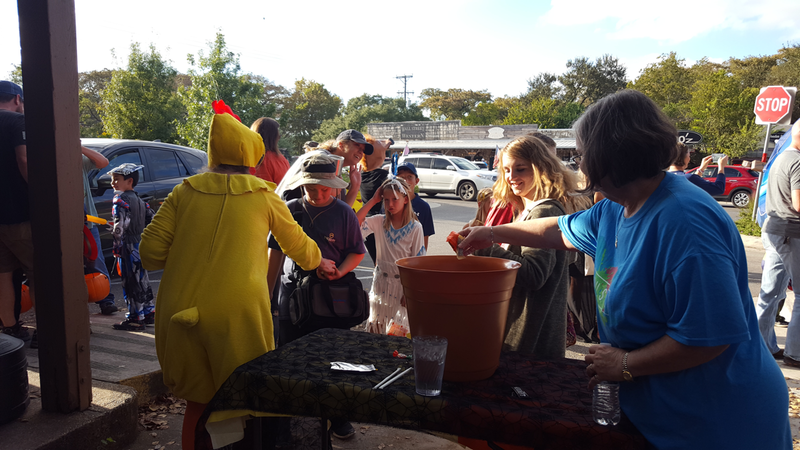 The Ladies Auxiliary makes monthly monetary donations to Fancy Feathers 4-H, Wimberley 4-H, Boy Scouts of America Troop 127, and Wimberley F.F.A. 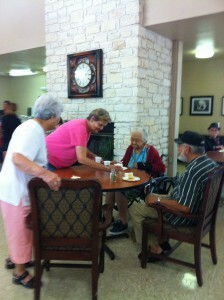 in exchange for their working in the Bingo Concession Stand. Yearly monetary donations are made to Gold Santa, Snowball Express, Down Home Ranch, and the Warrior and Family Support Center at Fort Sam Houston in San Antonio, TX. The Ladies Auxiliary's Blanket Brigade also donates handmade blankets to the Warrior and Family Support Center and Audie Murphy Hospital in San Antonio, TX. 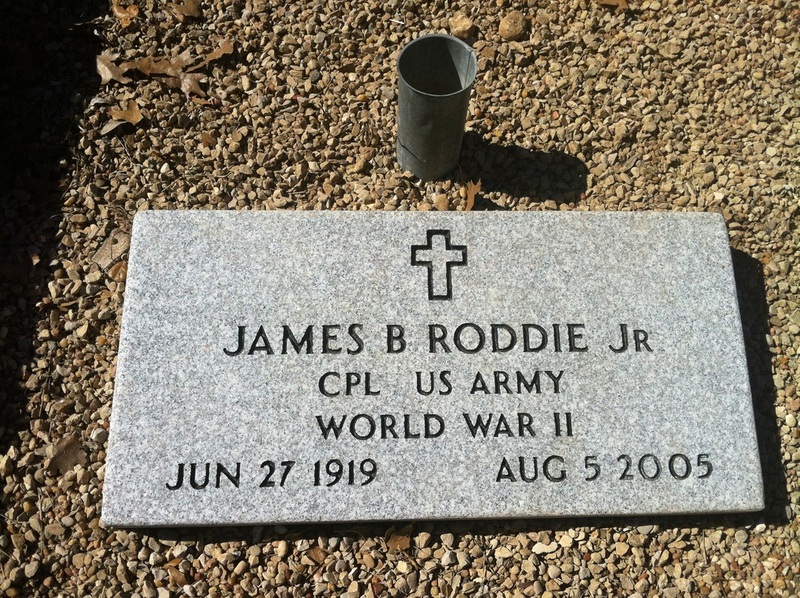 After a phone call from Mary Joe Roddie, the Post found out that somehow her husband's headstone had not been ordered or placed on his grave. 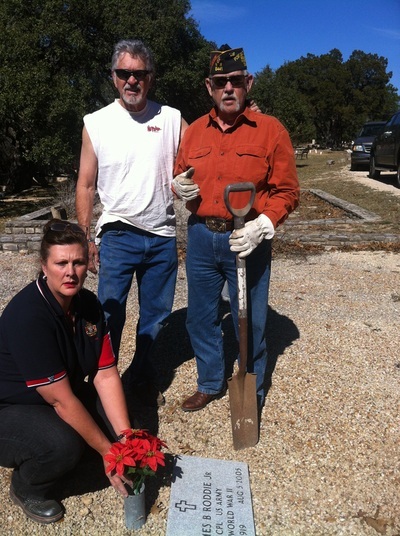 Michael and Glenn made a trip to Ms. Roddie's home, with a follow up visit from Neta with the necessary paperwork. After a wait of about 4 weeks the headstone was in and ready to be placed. 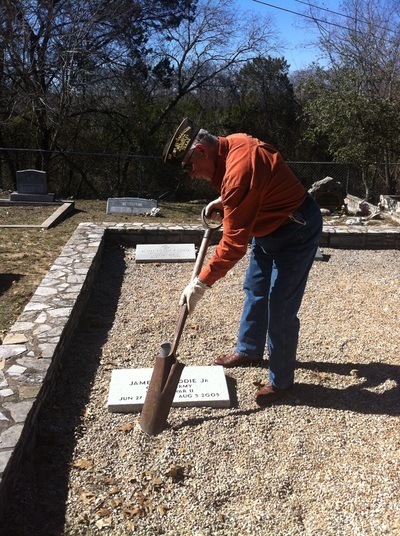 After the stone was set, arrangements were made to have Mary Joe and her Granddaughter come out to the grave side for a honor guard presentation of the American Flag. 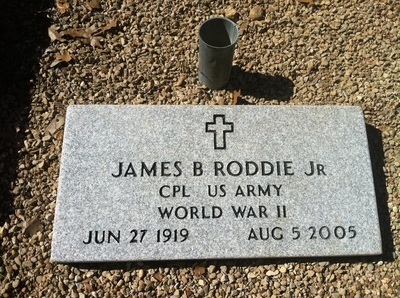 Ms. Roddie was so appreciative of all the time we had spent to take care of her and her departed husband.